Q: Is the air conditioner too old? “Too old” is a relative term. We mentioned a range of 10–15 years above, and ACs can sometimes continue to work past 15 years and even make it to 20 (although that’s uncommon). The age in years alone isn’t the best way to determine if an air conditioning system needs to be replaced. However, our technicians are familiar with working on central ACs of all types, so they can usually tell when a certain model is nearing the end. They’ll inform you if your air conditioner has moved into the retirement age bracket. Q: Is the air conditioner still running efficiently? Part of the inspection for an air conditioner is testing its electrical draw and airflow. This tells the technician how well the system is working and if it has suffered from a drop in energy efficiency. Any AC will lose efficiency over time, but if a unit is regularly cared-for it shouldn’t lose more than 5% of its original efficiency rating until the end of its service life. If your tech tells you efficiency dropped farther than 5%, you may want to replace the air conditioner. Q: If the system needs repairs, are the repairs worth the cost? A technician may inform you the AC has a malfunction that should be fixed before summer arrives. You’ll need to decide if the repair is too expensive to be worth it, and the technician will be glad to help you with this choice. For example, the tech may tell you that because the repair cost is more than half the cost of a new system, you need a new system. Our technicians are honest and won’t try to sell you a new AC if repairs are still cost-effective. Q: What are some of my replacement options? You may still feel on the fence. Ask the technician about some of the current AC models available for replacement. Many high-efficiency air conditioner units can make a significant difference in your home’s energy consumption. That’s an appealing option if you’re looking to cut down on your utility bills. You may also find a model that’s priced just right for what you need. 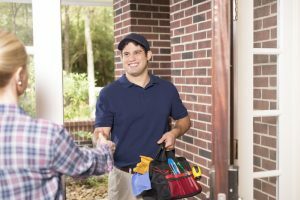 Touchstone Heating & Air Inc serves North Central Florida with the finest air conditioning maintenance, repairs, and more. Schedule a maintenance appointment today!